Ever since I read the tale of "East of the Sun, West of the Moon," I've longed to give one of its numerous re-tellings a try. 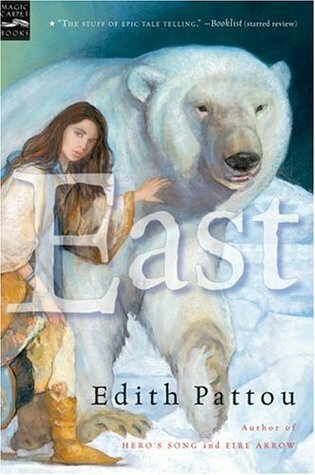 Edith Pattou's version, East, practically fell into my lap when I discovered it in the hidden recess of my Kindle and within moments, I was sucked into the tale. For those of you who don't know, "East of the Sun, West of the Moon" is similar to "Beauty and the Beast," only instead of a beast, we have a polar bear, and instead of a wicked witch, there is an evil troll queen. Of course, there are a variety of other differences, but the jist of the tale is the same - a girl must find it in her to remain with and love a creature who is more animal than man. And while East isn't the best re-telling I've read, it's nearly perfect in its own right. For me, what makes or breaks a solid re-telling is the author's own insight into a traditional fairy tale. It's part of the reason why I'm so disenchanted with book-to-movie adaptations - I desperately want the director to push the story on screen with his or her interpretations instead of merely following the book word-for-word or deleting scenes altogether. In East, Pattou truly gives so much depth to this intriguing tale. For one, the novel is told in alternating perspectives, each chapter shifting from the point of views of Rose, her older brother Neddy, her Father, the Troll Queen, or the Bear himself. While, on one hand, I was initially skeptical about this method of story-telling, let me reassure you that it works beautifully. Not only are we able to gain a much fuller understanding of the entire story at hand, but we are also able to understand these central characters on a much deeper level. Moreover, I love that the villains of this tale are so ambiguous in their "evil" label. The Troll Queen, for instance, is obsessed with the human prince she finds; so much so that she fakes his death and is punished for her actions by her father. Ironically, though, her punishment entails the imprisonment of the prince she loves. And thus, a boy is turned into a bear. Furthermore, it is not evil intent that drips from the Troll Queen, but rather a strange, obsessive longing. If anything, the Troll Queen is an anomaly among her kind, especially as trolls keep humans as servants. The Troll Queen, however, isn't our only "villain." Rose, the protagonist of our tale, is born facing the North, which indicates both that she will become a traveler and also that she will - as her mother's only North child - face death at the hands of ice and snow. As such, her mother does everything in her power to keep Rose safe, but often times that spells more harm than good. I love that this family is painted so realistically. Rose is beloved by her brother Neddy, not to mention her father, and while her mother clearly cares for her, there is a distance between them that is written with poise. As the last child in a household of seven, not to mention a replacement child for the East daughter who died, Rose and her mother share a strained relationship. And yet, Rose's love and affection for her family - for all her sisters and brothers - is so palpably felt. In fact, Rose herself is such a remarkable heroine for the emotion she brings to this tale. While her adventurous spirit is one to get behind and her genuine loyalty to be admired, her flaws - her curiosity, her homesickness, her inability to follow directions - makes her all the more realistic. Moreover, I love that Rose never gives up. No matter how difficult the task before her seems, she keeps barreling forward. Another beautiful aspect to this tale is the romance. The White Bear, as Rose comes to call him, is sweet and kind, hopeful that Rose will enjoy her stay at his castle. And yet, he too is not all perfect. Ultimately, the reason why I grew to love Rose's time in the castle was primarily because of her interactions with the Bear, which were both endearing and exasperating. Stuck in a difficult situation, tempers rise just as often as they fall, which made for intriguing reading. Once the bear is kidnapped away by the Troll Queen, however, the second-half of this story only picks up. I appreciated this not so much because of the change of pace, but rather because Rose sets out after the Bear solely because she let him down. Of course, she cares for him, but the extent of her feelings are hidden even from herself until much later in the story. The romance that brews in East is extraordinarily subtle, only hinting at the depth of affection that lies between Rose and the Bear, but the focus on trust that the novel took was far more important as a foundation for their future, fitting perfectly into this tale. If you haven't already, I'd encourage you to look into this fairy tale. It's an interesting spin, especially as "Beauty and the Beast" is so well-known. Moreover, Pattou's rendition of it is more than satisfying, going so far as to touch upon Norse mythology and Inuit history. Although the ultimate conclusion regarding the Troll Queen seemed to tie up a little too neatly for my tastes, overall, this novel is perfect from beginning to end. What Pattou excels at, as a writer, is showing, not telling, which makes this story a true emotional experience. I dare you not to become completely enthralled by Rose's tale - I promise you, it is impossible! Aww that polar bear on the cover is so adorable! Great to see that the romance was really well done and had a flawed-not ridiculously flawed love interest. "Moreover, I love that the villains of this tale are so ambiguous in their "evil" label." I don't really know why I've continuously overlooked this book. Fairy tales and re-imagined takes on the classics speak to my soul - especially when the villains are painted in shades of gray, rather than stark black and white. Lovely review, Keertana! Why haven't I heard of this fairytale? You know I'm a huge Beauty and the Beast fan, and I love the idea of those concepts transported into Norse or Inuit mythology. I really like how you articulate what you're looking for in a retelling - the author's own spin or take on the tale, instead of just rehashing the original facts without much insight. The cover of this book makes me think that it's younger/Middle Grade, but the story sounds like one that is transcendent. I definitely want to read a retelling of East soon! Although I'm not fond of retellings at all, this sounds quite lovely, especially the realistic portrayal of family relationships. Btw, I'm very curious to see what you'll make of Another Little Piece. I liked it a lot, but it's certainly an odd read. Gorgeously written review, my friend. YES. A retelling is pointless if the author doesn't have anything to say about the story, or doesn't have his or her own unique perspective to bring. Otherwise it's just rehashing of something you already know. I am always attracted to fairy tale retellings because I LOVE fairy tales, but I am also very wary of them for just the reasons you mentioned. I am definitely adding this to my list after reading your lovely review, though--thank you, Keertana! This sounds like a beautiful book. I've never heard of that fairytale before. It sounds so different. I'll definitely have to look into this retelling and even the fairytale. Great review as always, Keertana!